Since the end of World War II, the United States’ share in world GDP has fallen from nearly 30% to about 18%. Other advanced economies have also experienced sustained declines in their respective slices of the global pie. But you wouldn’t know it from looking at the international monetary system. Over time, fulfilling the global demand for reserves caused a steady rise in the ratio of “paper dollar” reserves to gold reserves, which was incompatible with maintaining the official dollar/gold parity. The incompatibility of the national goal (maintaining the parity) and America’s international role as sole provider of the reserve currency was the essence of the dilemma that the Belgian economist Robert Triffin foresaw (as early as 1960) as a risk to the Bretton Woods system. 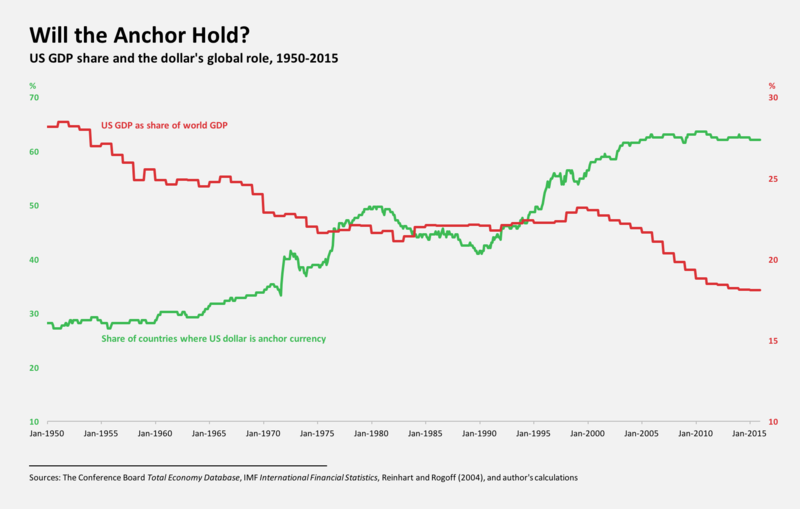 Now as then, the US could meet the rest of the world’s appetite for dollars by issuing more dollar debt. This would require the US to run sustained current-account deficits, mirrored in fiscal deficits. Of course, while the link to gold is passé, any domestic fiscal objective to curb US debt growth would be at odds with the international role as sole provider of the reserve currency.